Cardiff City have pulled Aaron Ramsey out of the Wales Under-19 squad for the Milk Cup tournament in Northern Ireland (27 July-4 August). Bluebirds manager Dave Jones wants to midfielder Ramsey to remain with the club to prepare for the opening game of the season against Stoke on 11 August. 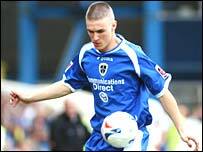 Ramsey, the youngest player to play for the Bluebirds, has been replaced by Swindon Town's Tom Evans. Wales will play Chile and Israel in the Elite section at the youth tournament. The team will the most points from the two group games will qualify for the final to face either Denmark, Turkey or Northern Ireland. Wales Under-19 squad: Rhys Taylor (Chelsea), Jonathan North (Watford), Christian Ribeiro (Bristol City), James Wilson (Bristol City), Neil Taylor (Wrexham), Damien Hopkins (Bradford City), Daniel Knight (Oldham Athletic), Joe Allen (Swansea City), Joe Partington (Bournemouth), Keiron Howard (Swansea City), Sam Wade (Cardiff City), Chris Jomes (Swansea City), Jonathan Brown (Cardiff City), Tom Evans (Swindon Town), Matthew De Cae (RFCU Luxembourg), Jamie Price (Wrexham), Oliver Hewitt-Fisher (Swansea City), Kenleigh Owen (Oldham Athletic).